An exciting package of electronics loaded onto what was already an impressive electro-acoustic. Control panel rotaries can be fiddly. The Eclipse's Nanoflex 6 undersaddle pickup takes a signal from each individual string. The output of each individual string can by regulated by the six small rotaries. The Eclipse Venus's solid spruce and mahogany body offers full and versatile tones. Though not labelled as such, the current range of Faith guitars is comprised of third generation models. The UK's own Patrick James Eggle (who works closely with Faith) has overseen the improvements to the new series of guitars, which includes a new bridge design, new bridge pins, solid flamed maple binding and a wider, higher quality abalone soundhole rosette. The body's resonance has also been improved, so says Faith, by thinning the high-gloss finish. "The Eclipse's Shadow system is powerful and articulate while the rotaries offer an admirable degree of control." Ebony has been introduced for the headplate (which, in our opinion, should have also been finished in black gloss) and heel cap, while gold hardware has been replaced by chrome. The most interesting and potentially exciting upgrade relates to the installation of the Shadow L4020 Hex preamp and Nanoflex 6 Hex undersaddle pickup. Faith is the first firm to use this system on a production model, though Martin has previously fitted it to selected signature guitars. The two key features to this electronics package are the preamp's adjustable stereo output and the facility to individually control the volume from each string signal. The Nanoflex 6 captures each string's output and sends it via six individual wires to the preamp. Small near-flush mounted rotaries on the control panel require either a pick, small screwdriver or a fingernail for adjustments. The benefits of this are obvious: some undersaddle pickups struggle to produce an even, balanced output. Being able to manage each string's signal gives you ultimate control. To fully utilise the stereo capabilities for maximum benefit, you'll need to swap the standard instrument cable for a 'Y' stereo lead. You'll also need either two amplifiers or a two-channel PA.
That said, you can use a standard cable and sweep the pan rotary to the far left; the system then acts like any other mono pickup. If used this way, a dash of stereo can be dialled in to beef-up the sound. The centre-indented pan rotary determines where the six strings sit in the stereo field. Set far right, the low E string pans left while the top E pans right. The strings in between are set equidistant between the two extremes. Rolling the pan rotary to a more moderate setting subdues the stereo split and creates a fuller output. Isolating either end of the tonal spectrum opens up a whole world of possibilities. In practice, an effect (such as reverb or chorus) could be applied to, say, just the treble strings, while the bass could be left unaffected. 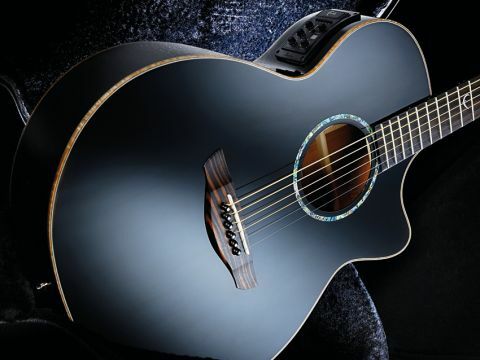 The acoustic properties of the Faith Eclipse guitars are well known. The all-solid Eclipse Venus offers a full, bright tone, more than capable of handling a range of disciplines. On this occasion though, it's the electronics that are of real interest - and we're not disappointed. The Shadow system is powerful and articulate while the rotaries offer an admirable degree of control. Having bass, mid and treble controls almost seems superfluous, because the benefits of the stereo split allow for in-depth tone shaping. We particularly like the 'note-bouncing' effect achieved with the pan rotary set far right and played through two amps positioned either side of the player. Place the two amps together and simple strumming morphs into a double-track sound. Throw in a delay pedal and be prepared for some acoustic pyrotechnics! The facility to control the individual string volume is useful too, particularly for fingerstyle. Beware though, be ready to lose hours of your life fiddling! Clearly, what Shadow has developed is very clever and will no doubt appeal primarily to the more demanding recording artist who may experiment with sound layering, looping and multi-tracking. A couple of words of caution though. Too much 'tonal interference' can lead to a very unnatural sounding output. We're also unsure of the benefits of onstage use. Would one side of the audience be bombarded with bass while the other trounced with top? As a package, there are two ways of looking at this. Either take the view that the popular Eclipse range of electros now has the added bonus of a stereo preamp - at no extra cost - or focus on the stereo capabilities and let the crazy stuff begin! You choose.